He is definitely one of the richest and most famous private boat owners in the world, but his fame reached a peak at the exact moment he decided to commission the construction of the largest sloop ever built in the world. Joseph Vittoria lives in Palm Beach with his wife, and judging by his C.V., you would guess his profession to be that of president. In fact he was president and chief executive of the Avis rental car company from 1987 to 1997. 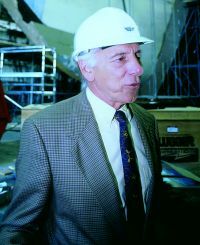 Then he went on to cover the same roles for Travel Services International, the largest tour operator in the world, handling over 10 million passengers a year, offering the widest range of services imaginable: from air transport to hotel bookings; from car rental to the organisation of exceptionally complex, articulated and above all exclusive excursions. As if all this were not enough, since February 2000 he has also been President of Puradyn Filter Technologies, a leading company in the production of special filters for lubricating oils, and has become a member of the executive boards of Transmedia Asia Pacific and Sirius Satellite Radio. We have to ask ourselves - no, better to ask him personally, since here he is under the bow of his new boat, now in its finishing stages at the Vosper Thornycroft boatyard in Southampton - when he finds time to breathe. Mr. Vittoria, how did you manage to leave your innumerable commitments to come here to England and follow the work in progress on Mirabella? A lot of my work concerns resolving all those problems linked to the movement of people all over the world, both for pleasure and work. How would I seem credible if I couldn't resolve my own? As well as being an international level manager, you are also one of the luckiest private boat owners in the world. How did you develop your nautical experience and how did you come to commission Vosper with construction of your new yacht? Rather than a boat owner, I prefer to see myself as a boat-builder, even if a rather special one. For example I organised a yard in Thailand which produced four sloops of no less than 40 metres in length. As far my decision to entrust Vosper with the realisation of this new boat is concerned, I have to say that it was almost an obligatory choice - since I wanted a composite construction I had to turn to one of the most experienced yards in this specific field. Your private fleet is now one of the most prestigious in existence. After the now imminent launch of Mirabella V, which will be your favourite? In my small fleet there are another two highly prestigious units: Mirabella and Mirabella III. I am very attached to both of them, above all because they have given me the possibility of developing a new way of conceiving quality charters, dedicated to just a few guests, and of a very, very demanding kind. Obviously, if only because of the great effort involved, this latest unit about to be completed is certainly destined to become the prima donna of the family, and also in terms of future clients' expectations. Why such a big boat? My wife likes her comforts and I like sailing at high speeds - a combination of factors that force you towards a large boat. However, I'd like to state that it isn't just the length of the hull or the height of the mast that makes this production unique. There is actually a whole range of unprecedented things involved. 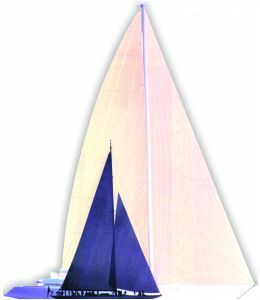 Take for example the asymmetric spinnaker: with its 3,000 square metres of surface area; it is the largest sail ever realised in the history of sailing, something that has forced Doyle OceanWeave to develop an exceptional study of shape, cut and materials. So your wife also took part in the project's development? Exactly. My wife supervised the project for the interiors, while I was involved in all the stages regarding the sail configutation with the yacht's skipper, Neil Batt. The relationship between the size and the number of beds for guests also shows that you prefer smaller groups. In fact my wife and I are lovers of small groups, which means you get to talk to everyone, without neglecting anyone. What's more, even before we got involved with large yachts, we always liked seeing our friends happy with what we offered them. But what you will offer your friends on Mirabella V won't exactly be free of charge. Well, somehow we have to recoup some of the 50 million dollars that this boat will cost me. Do you already have a price in mind? A week on Mirabella V will cost in the region of 250,000 dollars a week, all inclusive. Starting from when? And on which seas? After the by now imminent launch, we will spend a few months carrying out all the necessary sea trials and, if all goes as we hope, we will set out on the maiden voyage next spring. The theatre for our charter activity will be one that is now traditional for us: the Caribbean during the winter months and your fabulous Mediterranean during the summer. Min. Draught (raised keel): 3.90 m.
Max. Draught (lowered keel): 10 m.
Sail surface area: 2.791 sq. m.